HARARE, May 21 2013 (IPS) - For the last month Gibson Severe and his wife, Merjury Severe, known opposition supporters from Hurungwe district in Zimbabwe’s Mashonaland West Province, have been hiding out in the country’s capital Harare. The Movement for Democratic Change – Morgan Tsvangirai (MDC–T) supporters were forced to flee their rural home in Hurungwe district after Zimbabwe African National Union – Patriotic Front (Zanu-PF) militias threatened them for encouraging people to participate in the recently-ended mobile voter registration. “It’s been a month since we left Hurungwe district after the Jochomondo militia, which has known links to Zanu-PF, besieged our rural home accusing us of encouraging people to register to vote for the MDC-T,” Gibson Severe told IPS. Since last year, the Jochomondo militia has allegedly terrorised residents in Zimbabwe’s northern Hurungwe district, a Zanu-PF-stronghold, making it almost impossible for opposition parties to campaign in the region. Merjury Severe told IPS that elections in this southern African nation have become associated with threats and violence. “This is not the first time we have been subjected to intimidation. In the 2008 presidential runoff we were beaten up for being MDC-T sympathisers,” she said. Zimbabweans will go to the polls sometime later this year to vote for a new president. Current President Robert Mugabe, 89, has been in office for 33 years in a reign characterised by corruption, oppression, forced land seizures and a failing economy. However, Prime Minister Morgan Tsvangirai recently told media that the date for the elections would only be set after voter registration was completed. Although mobile registration has ended, voters can still register at the Registrar General’s office. But as Zimbabwe’s first round of 30-day mobile voter registration ended on Sunday, May 19, the process was marked by long queues, slow registration and intimidation by violent gangs with suspected Zanu-PF links. Zanu-PF-linked militias who call themselves Al-Shabaab, named after Somalia’s Islamic terrorist group, are alleged to have threatened the electorate in Midlands Province. “The mobile voter registration exercise here irked Zanu-PF stooges who have directed their anger towards teachers in rural communities, fiercely warning them against voting for the (two) MDC formations,” a local councilor from Midlands Province told IPS. The MDC split in 2006 into the MDC-T and the MDC-Ncube, which is led by Professor Welshman Ncube. Officials from Marondera, the capital of Mashonaland East Province, situated some 72 km east of Harare, said villagers were forced by suspected Zanu-PF-linked militias to participate in the voter registration process. “People were being abused by Zanu-PF militias, who were singing liberation war songs and chanting party slogans, and forced into (going to) register to vote,” a local district official in Marondera told IPS. 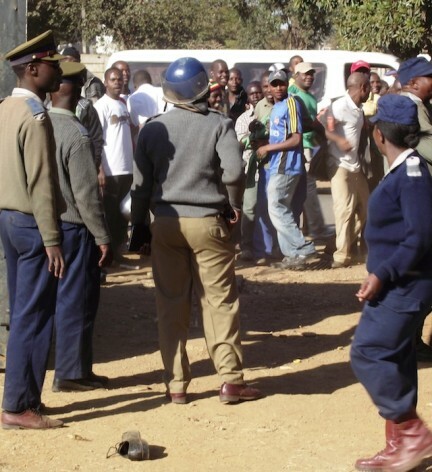 Police from Mashonaland Central Province’s Bindura and Mazowe towns, which are located about 90 km north of Harare, said that people there still live in fear of a repeat of the violence that ensued during the country’s previous elections. Many are scared just to publicly support political parties. “Nobody wears MDC-T shirts here after the 2008 violent elections that left thousands of people maimed. Zanu-PF is going to use this to win this election, by reminding people about the June 2008 atrocities,” a top police official told IPS. Human Rights Watch said in its January 2013 report titled “Race Against Time: The Need for Legal and Institutional Reforms Ahead of Zimbabwe’s Elections,” that over 200 people died in the 2008 election violence. So far, no arrests have been made in any of the cases of apparent intimidation. However, Zanu-PF spokesperson Rugare Gumbo dismissed the reports. “There is nothing like terror groups linked to our party. Why should we beat people into submission when it’s well known that the MDCs have lost supporters to Zanu-PF?” Gumbo told IPS. Zimbabwe’s mobile voter registration process was flawed. “Mobile voter registration was disjointed and weak, perhaps deliberately. There is no voter education in Zimbabwe … the Zimbabwe Electoral Commission (ZEC) has neither the capacity nor the political will (to carry out voter education). The act gives untold power to the police, and many have claimed that Mugabe has used the country’s security forces to intimidate his opposition. Local rights groups also expressed concern about the mobile voter registration. “We embrace the exercise. But we are worried by the manner in which it was being conducted in rural areas, where Zanu-PF members were distributing membership forms, purporting to carry out voter registration,” David Chidende, programme manager for Youth Information and Education For Behaviour Change, a democracy lobby group, told IPS. Once Mugabe approves the country’s new constitution, a second round of voter registration and inspection will take place. “We still have an additional 30-day voter registration period provided for by the draft constitution,” ZEC chairperson, Justice Rita Makarau, told the local Financial Gazette newspaper.